Want to know if your book’s dedication should be personal, professional, or commercial? New authors often think dedicating a book is easy, and for that first book it usually is. You dedicate it to “My loving wife” or “My devoted husband.” After all, you want to keep the peace, right? So, how do you decide who gets your cherished book dedication? Will someone be offended if I leave him or her out? This is typically a spouse, but it doesn’t have to be. If there is someone you simply have to dedicate the book to, do it. Remember, you can always add other names to your dedication. You can also find a clever way around the problem (see below). Do I know someone who would push this book to everyone he knows if he’s mentioned in the dedication? Sure, this one may seem crass and commercial, but you want to sell as many copies as possible, right? A natural salesman is a natural choice! Did someone make this book possible, or could make the next one possible? This is typically an editor or publisher, but it could be a fellow author who proved invaluable in critiquing your early drafts, or someone who recommended your work to a publisher, agent, etc. It could, of course, be your entire writers group, or a friend who kept nagging you to get back to work and get those pages done. Jay Leno poses with fellow comedian Tommy Moore, holding Tommy’s book. long shot, though I’ve seen celebrities mentioned in a book go on to promote it in some way. Of course, you run the risk that said celebrity won’t like the book, you’ll get a letter saying to “cease and desist” because it’s tantamount to an endorsement, etc. Unless you run it by the celebrity, know them personally, or they’re no longer with us (e.g., dedicating a book about Hollywood’s Golden Age to Clark Gable, etc. ), I’d skip this step. Still, there are ways around that, too (see below again). Or, if you can write something funny, something that is clearly a parody, you can pull it off (see the featured image for this article on the home page for a great example of this). I would ask these questions in this order, extending from the personal to the commercial. Start with those closest to you–the people who have stood by you and made time for you to write. If there isn’t anyone, or you’ve already dedicated a book to them, think about ways your dedication can help sales. Whoever you dedicate it to, do your best to make sure that person is, and hopefully always will be, in your corner. Author Tommy Moore, pictured above with Jay Leno, dedicated his first book to his wife, Suzanne. His second and third books, however, are dedicated to other people. He still managed to thank his wife in those books, though, in the Acknowledgements. You can always find a way to thank people important to you–in print–without dedicating your book to them. I dedicated my first four books to each of my three children and one to my great-grandmother because she inspired me, many years ago, to write that story. But my next book (JUST FOR KICKS! 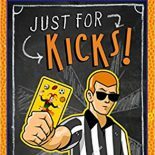 : 600 KNOCK-OUT JOKES, PUNS AND RIDDLES ABOUT SPORTS) is dedicated to three sports figures famous for having a great sense of humor. Two of them follow the Clark Gable rule: they, unfortunately, are no longer with us. The third, however, is. Being that I didn’t want to jump through hoops to get his approval for and endorsement, I simply used their first names with a sincere thank you for all they’ve done for baseball. To Bill, Max, and Bob – thank you for keeping baseball fun. That’s Bill Veeck, Max Patkin, and Bob Uecker. So, if you need to dedicate your book to the well-known, think about using a first name only. Unless it’s Cher. Then we’ll know. Good luck with your dedication, and may whoever you dedicate your book to appreciate it as much as you appreciate them! This entry was posted on September 10, 2018 by johnbriggsbooks in book dedications, Books, Publishing, Writing and tagged book dedications, self-publishing, writing, writing advice.